KANSAS CITY, Mo. 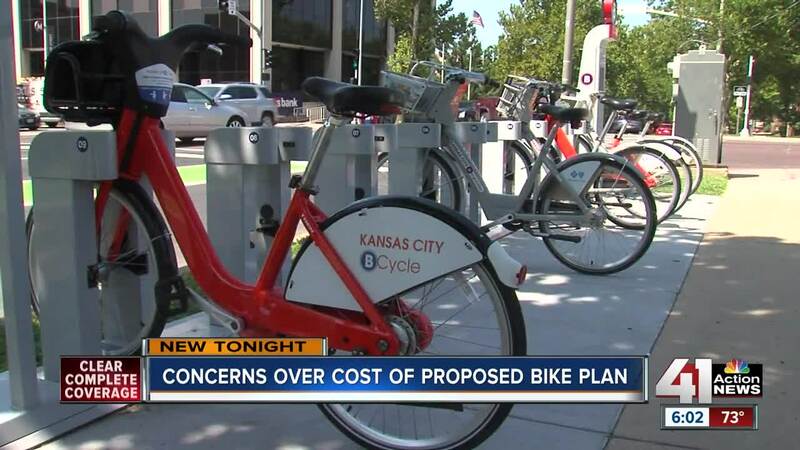 — For several months, officials with Kansas City, Missouri, have met with the public about what the proposed bike plan would look like and why it's needed. Now, a major infrastructure push could be a step closer to becoming reality and making KCMO a more bike-friendly city. The Bike KC Master Plan aims to transportation connectivity a priority by adding more bike lanes, creating a bike-share program, installing and upgrading facilities, and teaching classes. The cost of the plan's myriad proposal could range from $387 million to $418 million dollars — money earmarked from general obligation bonds, sales tax and some federal dollars. A report by the city auditor in 2016 found the city’s current bike plan did not provide the proper guidance to help the city achieve its goal of becoming a platinum level bike friendly city by 2020 as determined by the League of American Bicyclists. The new bike plan would help cyclists like Manuel Esteban, who hopes to see more lanes for him to get around. "I get a lot of close calls when I'm riding on non-bike lanes and I get people really close to me," Esteban said. "It's kind of piece of mind when I'm riding." BikeWalkKC has endorsed the plan. "It tries to outline what some of these new bike lanes could look like, so it does try to separate between major separations so what you would like to see on Armour and some minor separations, where it's really just paint that's on the pavement," BikeWalkKC Policy Coordinator Michael Kelley said. "You'll see different types of bike infrastructure." Other groups, like the Show Me Institute, argue that the city is wasting time and money on this plan. "Spending millions of dollars on people who probably will never bike to work and then neglect those bike lanes when the weather goes south is just a waste of money," Show Me Institute Director of Municipal Policy Patrick Tuohey said. According to the U.S. Census Bureau, the percentage of people who say they bike to work nationally fell 3.2% from 2016 to 2017. In some cities, like Cleveland and Tampa, Florida, cycling to work fell by more than 50%, Other places, in Portland, Oregon, and Long Beach, California, have seen an increase in people biking to work. "Kansas City I would say is definitely in the middle," Kelley said. "They are investing more now. I think they are beginning to see greater usage of people who want to bike on these sorts of things." The Show Me Institute countered that only a small fraction of people actually bike to work and cars remain the top choice for personal travel. "Kansas City has significant needs, significant transit needs," Tuohey said. "They are not biking. It is infrastructure. It is infrastructure repairs. It's getting those steel plates off our streets." BikeWalkKC pointed out that precise data is hard to come by, but the organization believes adding more bike lanes will spur increased ridership. KCMO's Planning and Transportation committees will conduct a joint meeting Thursday to discuss the plan.